Here are some of the fall releases for the tabletop skirmishes wargame Warmachine and Hordes from Privateer Press! Love it when I can get a little love for Retribution! On first look the Lys Healer doesn’t really shine as a must have unit, but that doesn’t mean she can’t be very effective in the right circumstances. A very temperamental solo to say the least. Her Power of Faith ability will help against knockdown effects and we Retribution fellows tend to hate those. A feature I tend to like is her Move to Assist, this gives her a ton of movement range on the field and can possibly get her right in the thick of a spot where she’s needed. She’s going to be burden to some lists but unless you need her she’s a bit of a point soak. The Northkin Shaman seems like a interesting beast. 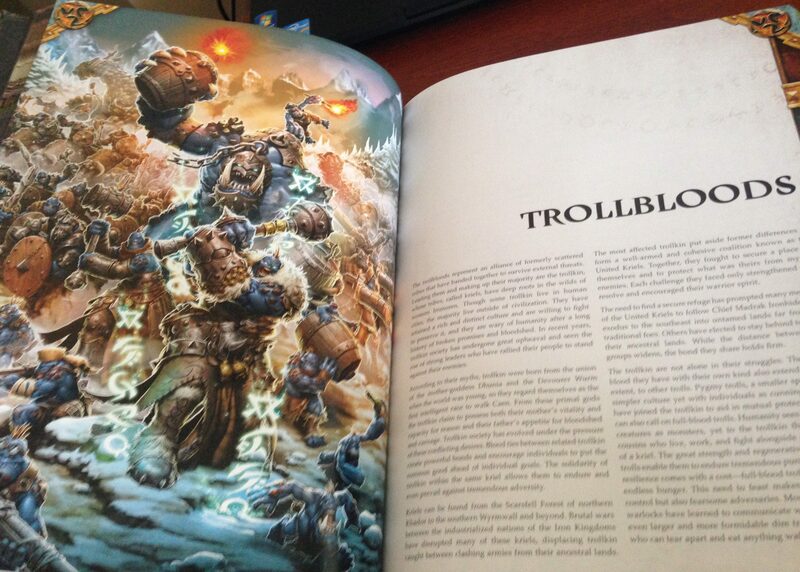 The longer I look at this unit, and I’m not a Trollblood guy, I’m seeing the most useful feature being its Freak Storm magic ability that not only allows for a cloud effect of a sizeable margin but also allows for the Northkin Shaman to teleport a distance away from where it stood upon casting the effect. If you have the faction allotted amount of two of these you can really wreck up some line of sight. Having a decent ARM and a fair number of boxes may give it some sustainability unless someone gets serious about taking it down. If you do find yourself not churning out AoE cloud effects every turn the Northkin Shaman can pack a decent punch with the magical ability Frostbite or can control the board a bit by lowering defense with Cold Snap, a magical ability that gives enemies the Chiller effect. Now here are some nasty ladies. Stats are all average, even for their double Magelock Pistols, but their abilities are where they really begin to shine. One especially nasty ability is their Blood Mist attack. If I recall correctly Blood Mist, an attack type that turns boxed enemies into a sizable cloud effect AoE, used to only work against living units. I noticed on this card though it now effects living or undead models. Not sure if you put two and two together but I can see a few shots being taken against some of your own units if it proves more favorable to put them down for a cloud effect! The group also houses the Black Penny as an attack type, always a nice feature for any ranged unit to ignore that melee DEF Bonus. If this group finds itself in a melee situation, not advised, they aren’t without tricks. Using their horns, and an average MAT, they can do a bit of damage. What you are really hoping for is the critical because they pack a Critical Knockdown ability as well. That’s all for now folks! 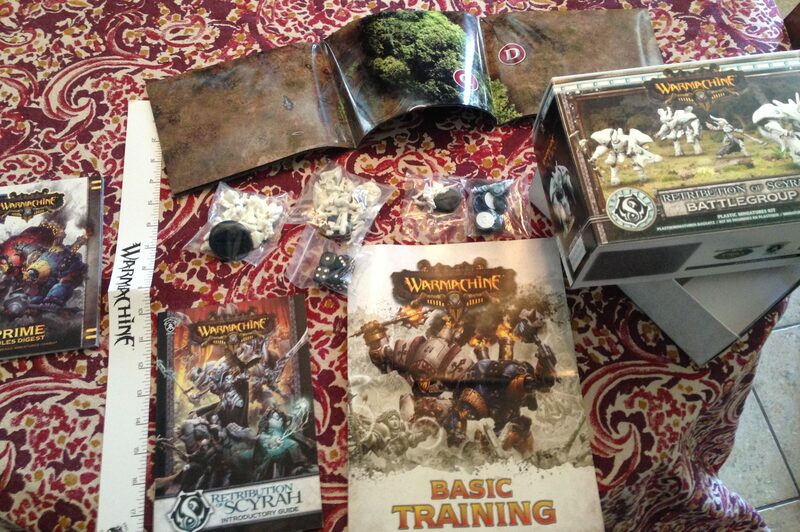 be sure to visit my Warmachine and Hordes page to find photos of painted figures and other posts about this great game and the spinoff roleplaying games Iron Kingdoms and Unleashed. 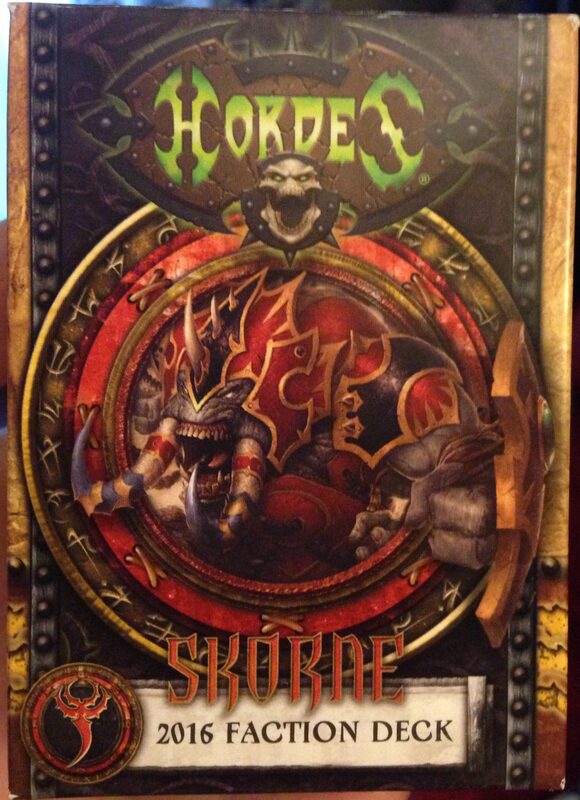 The third edition of Warmachine & Hordes has been upon us for some time now. I detailed a few of the new Starter boxes, along with their faction decks and even the newest editions of the core rulebooks, back in early July. 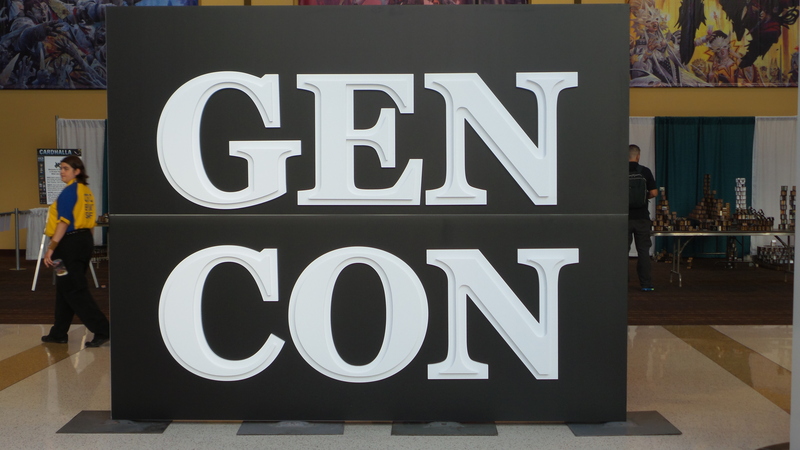 I got a chance to sit in on the Gen Con panel and it was plain to see, Privateer Press is armed to move forward with their wildly successful product lines. Fresh from the product line I was greeted with a bevy of new models this week, all August releases, for the Cryx and Cygnar factions! Let’s do a little unboxing shall we? Up first I’ll detail the resculpt of the ever popular Black 13th Strike Force. Now, I’m not a Cygnar guy but I’ve seen requests for years to resculpt these guys, essentially the major complaint has always been that they were dwarfed by other gun mages in the game. Chances are I’m not informing any Cygnar fans about the need for the resculpt, and you guy have to love being heard. The resculpt came out great! Ryan, Lynch, and Watts look fantastic and are ready as ever to die for the cause. Probably blasphemy but I love not having to glue a lot of pieces together. Very little flash to concern yourself with, excellent detail. There are a lot of changes to the card for this unit, namely it is streamlined and many of the individual tactics for each member have been either removed or merged with the others. What you have now is a single coherent unit. Sure some of the novelty of this group has disappeared, now that they no longer have individual specialties, but on the whole it is a much faster unit to play out. Now you don’t have to recall which ability went with which character. I’d prefer that, but then again at the table I’m still a novice. The Arcane Tempest Rifleman will be welcomed at any Cygnar table I’d imagine. As a Retribution guy I can attest that a Ghost Sniper or two finds its way into most of my armies and for a mere one extra point cost the Arcane Tempest Rifleman trumps Ghost Sniper every time. 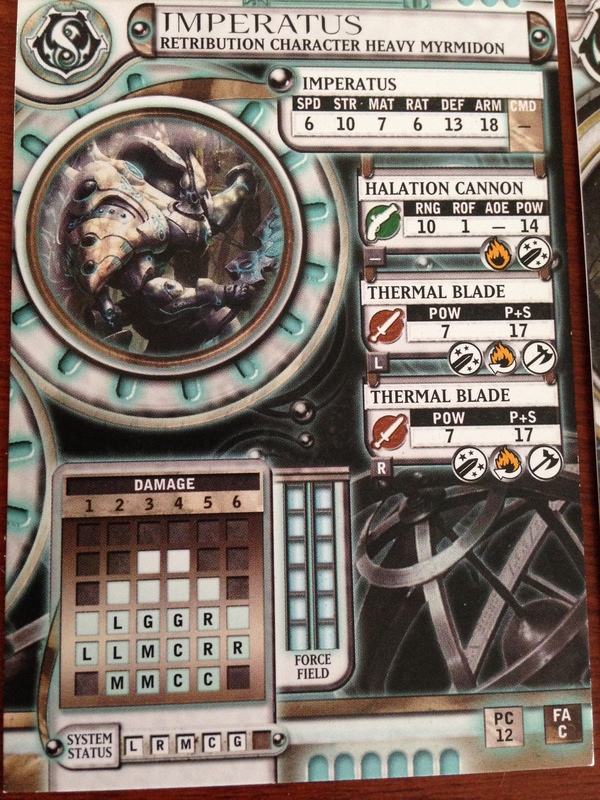 Having the Magelock Rifle grants him some actual attack options. Reposition beats out Swift Hunter, this guy comes with Arcane Precision to handle those stealthy punks. His weapon is a magical weapon too. Frankly, I’m jealous. So no lie here, I’m really jealous. One extra point cost has this guy trouncing my Ghost Sniper. The front card stats are the same too, though Ghost Sniper does get Pathfinder I guess. Oh well, congrats Cygnar players! Cryx has some nasty specimens eh? I can’t come right out and say that these guys are going to cause a ton of fear in a Cryx player’s foes but they certainly make for one Hell of a jamming unit. They can cover large swaths of ground with high SPD stat and with a Reposition ability that has some serious length, they have the ability to swoop down on an unsuspecting solo only to move on and jam up their true target unit later. A lot of flash on the smaller pieces but the level of detail is just top notch. I really like the perched guy, very different from the rest so it makes for a great leader piece. 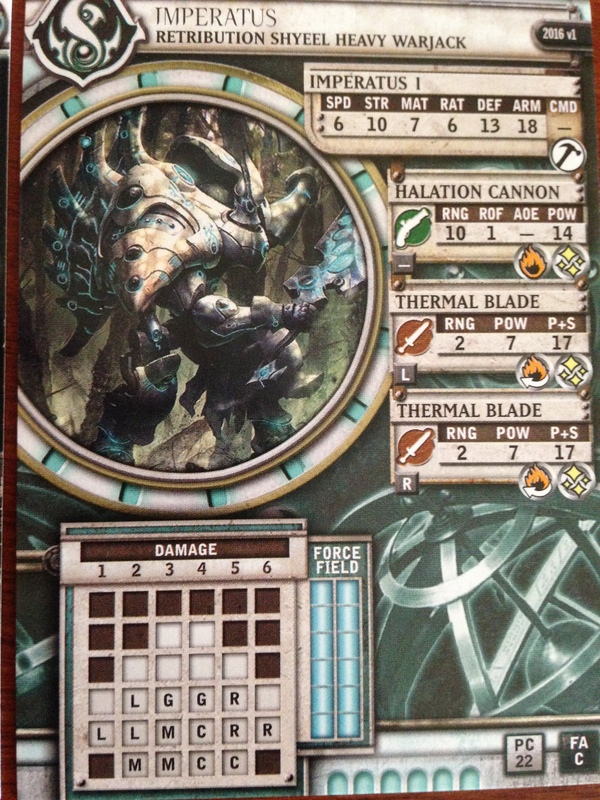 The unit size comes in either a group of six or a group of ten, and I’d say it yields a bit of a high point cost for what you get but I can imagine a few players that may like to throw this group out from time to time just to have something unique on the table. With the onset of mk III we finally get an actual sculpt for the Inflictor it seems. I’m digging the look, wondering how far that stinger arm will stretch though. Might cause a bit of cluster on the battlefield. I’ve always enjoyed getting an actual how-to map for putting these types of models together. Never been the best at it, really wish some units came with instructions personally. There have been plenty of times I’ve given the wrong hand to one of my poor guys. It’s fitting to place these two guys in a box together as choosing one over the other represents choosing one of two very different play styles. The Inflictor is a great unit to use if you need to protect your Warcaster from harm with its Shield Guard ability whereas the Seether is your standard rush and attack style crazoid. The lore even states that the Seether is basically uncontrollable, so that’s a fun image. 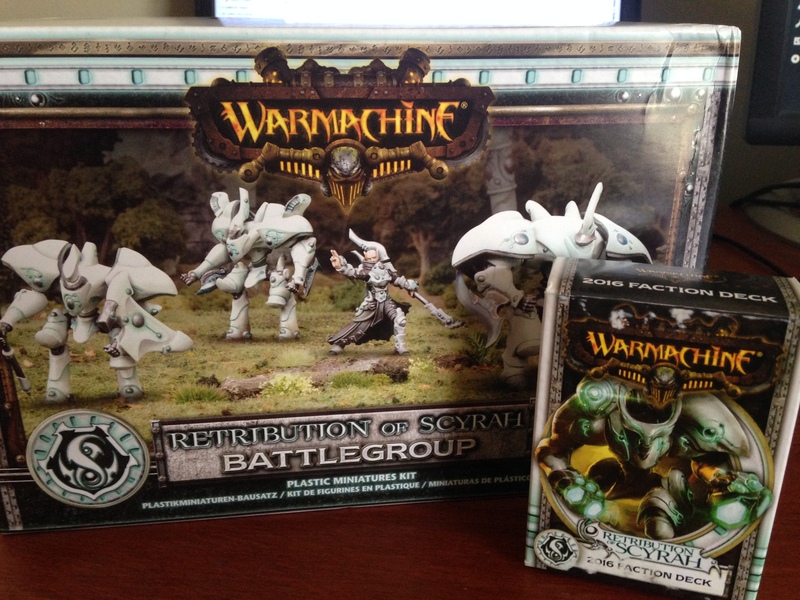 This has been my first true unboxing for Privateer Press’ Warmachine line, so I hope I did the game some justice. Feel free to leave a comment if you feel i left some critical information out as I’m just getting used to this style of review. Be honest, I can take it! I want to bring you the best possible information I can. Thanks all! A quick sidebar before the review. 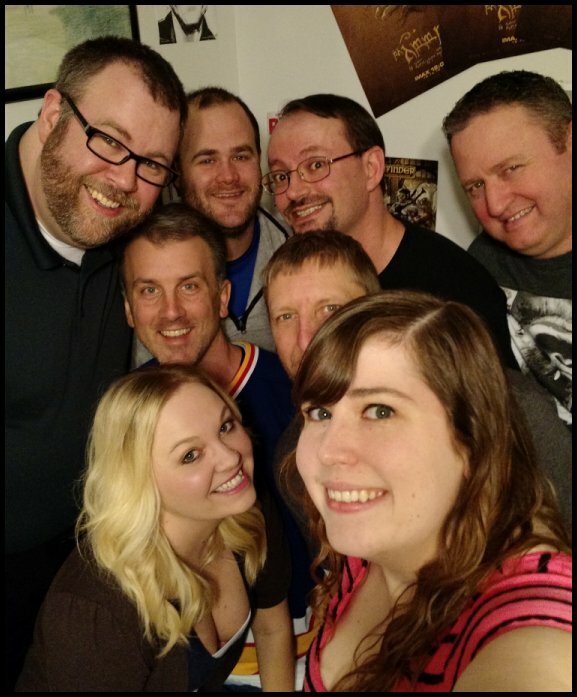 Melvin Smif’s Geekery has been nominated for an ENnie for Best Website! Voting is set to run July 11th through July 21st. I’d be very grateful for any votes received. While you’re there you may notice that one of my fellow network affiliates, The RPG Academy Podcast, was also nominated for Best Podcast. Please consider throwing them a vote as well! I’m already wildly excited and humbled to have been nominated. Thanks to all my readers for continuing to give me a reason to write. 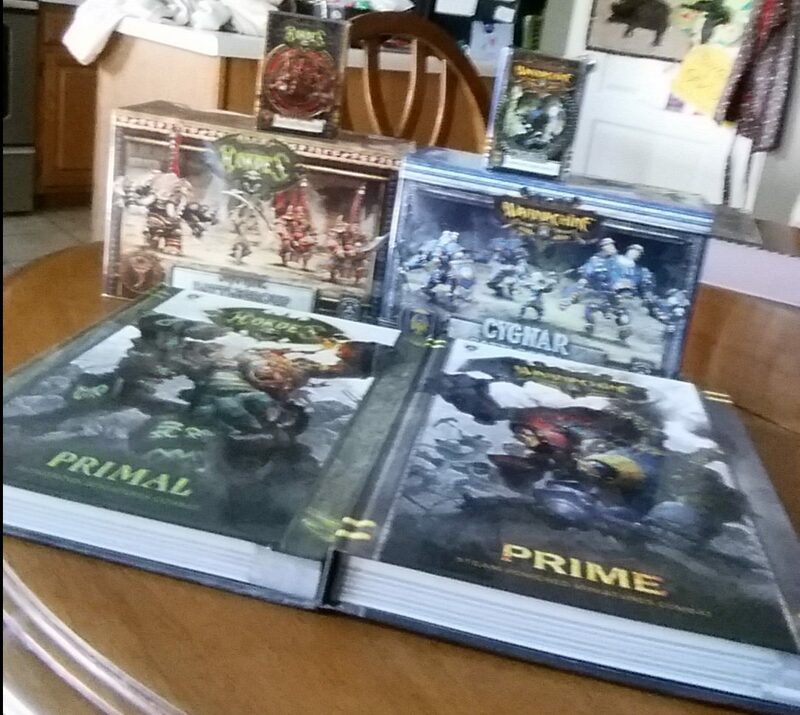 Now, on to the excellence that is WarmaHordes’ new edition! 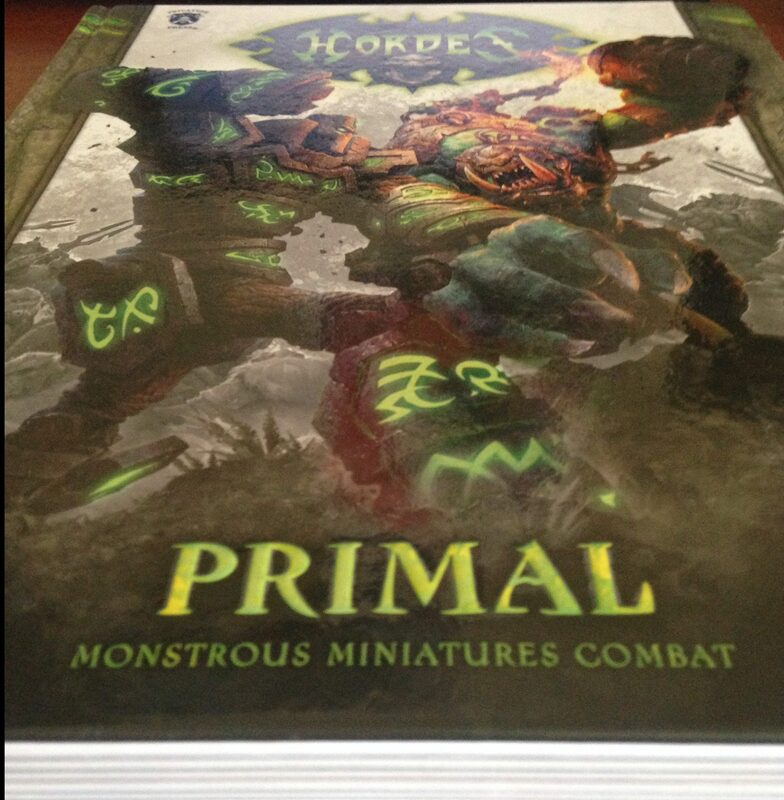 Back in April I informed you of the impending release of the newest edition of Warmachine and Hordes. Well, just the other day I received a package on my doorstep, and a press release in my email, from the fine folks at Privateer Press hallmarking its arrival! I spent time in my last post describing many of the changes in play that we would be seeing (adding the ability to pre-measure ranged shots, changes to balance units, etc. ), so let’s spend a little time just reveling in the beauty of the finished product shall we? Now, the first thing I did with my veritable horde of new gaming supplies was call up my buddy who plays those filthy, magic wielding, god killing Cygnar humans to see if he’d be interested in some trading because… well, a man has to get his hands on his Elves baby! I’d like to formally welcome Warcaster Magister Helynna to my army. New card. Look at the way it pops off the card! The new edition didn’t only revise some of the rules, one of my favorite changes comes from the look of each Miniature(s)’ stat card. I’m posting a side by side below. I really adore the way they expanded the area covered in the artwork. I feel in a heated, timed, game it might really help me spot the unit I’m trying to get information from. Not to mention, it just makes the cards look all the much better. Veterans have to update their faction’s stat cards for the new edition. Each box contains at least one redesigned stat card per model or unit and in the case of most Warjacks\Warbeast you’ll get multiple stat cards. The Faction Decks have an MSRP of $19.99 but I have seen many online going for roughly $17.95. A must have for veterans. 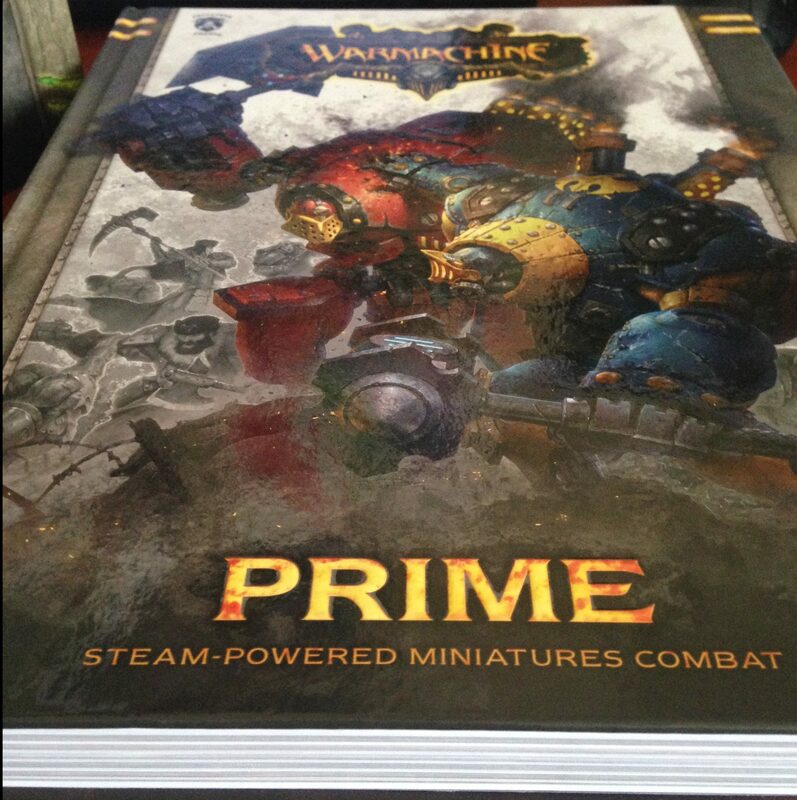 In recent years I’ve had the pleasure of reviewing a number of books from Privateer Press, they’ve all received high accolades from me. Great artwork, excellent binding, and chock full of information. The two core rule-books presented for this edition are no exceptions. Each book comes in well over 300 pages. In the first third of each book (after a lengthy history of their respective parts of the world of Immoren) you find detailed instructions on everything you’d need to know in order to play the game. From a macro understanding of basic rules and combat to intricate details like specific scenarios and terrain. 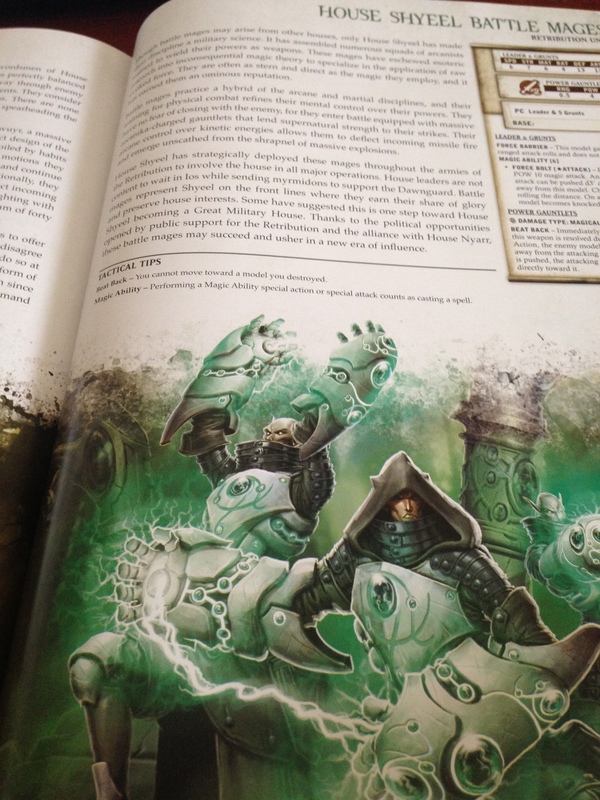 The remaining bulk of the books are mostly dedicated to vast introductions to the factions you may wish to field, followed by some useful appendixes that help explain some final peices of information needed for specific faction rules, how to play Warmachine v. Hordes, etc. Easily my favorite thing about these books lies with the extensive lore written for every faction. There is something unique about the world of the Iron Kingdoms, and its primal neighbors, that makes reading their histories so satisfying. 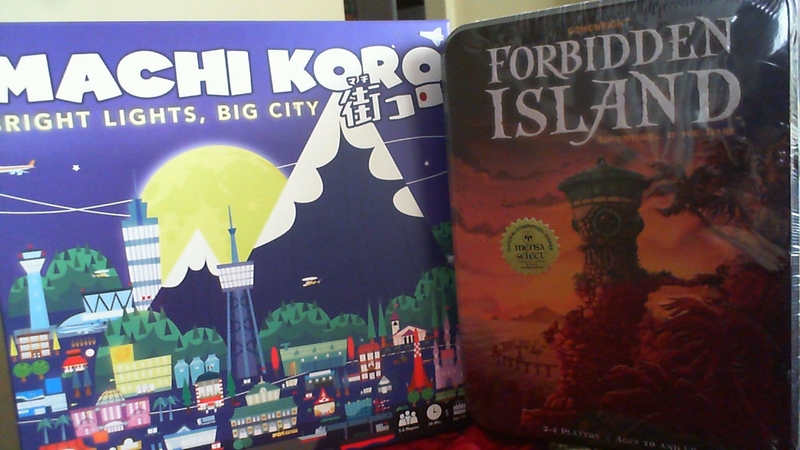 You know I’ve lauded the worldbuilding present in this company’s roleplaying games (Iron Kingdoms & Unleashed), well these books here will give you the full scope of every major faction in the world. 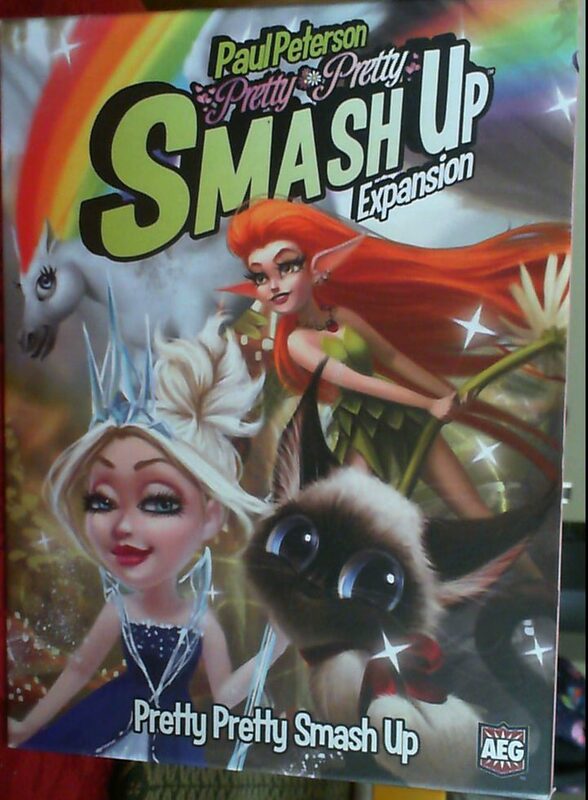 So if for some reason you aren’t into the the tabletop skirmish game, there is still something here for you. Pages and pages of juicy steampunk fantasy lore about a world at war. 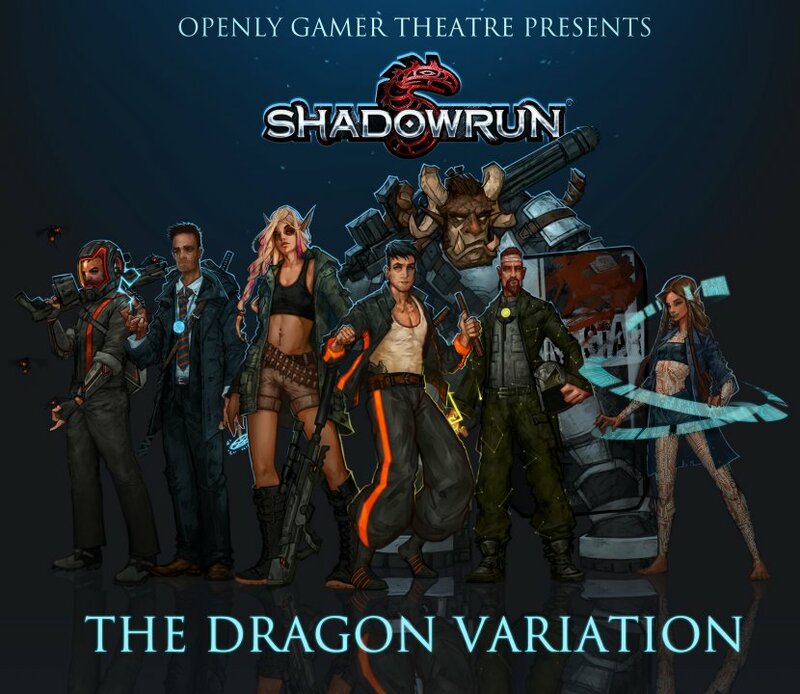 Each faction is detailed by it’s history, as mentioned above, and then has an extensive list of units touched on to give the reader a decent accounting of what the faction may play like. 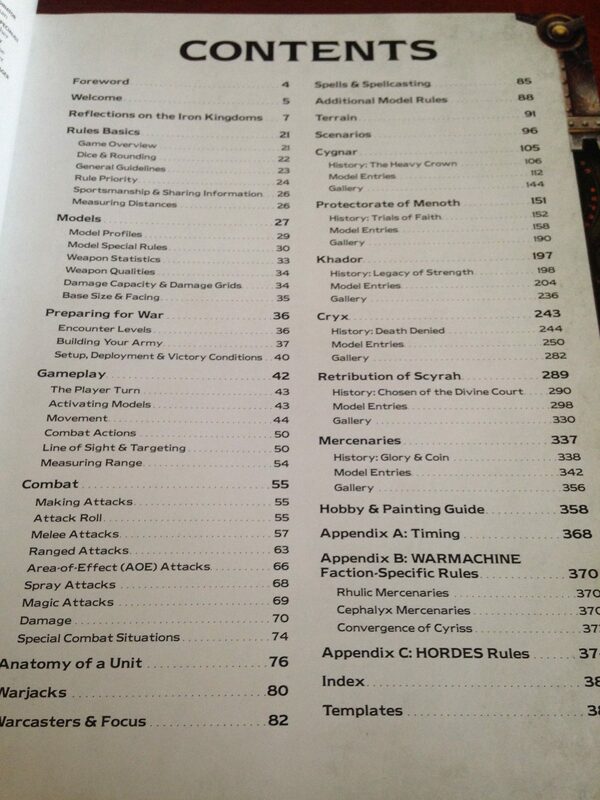 Obviously they couldn’t place every unit in a faction on page but I did notice that there appears to be an attempt to add a good amount of the new units out there, namely the new Warcasters and Warlocks present in the new 3rd Edition Battlegroups. The artwork remains impressive, litters the books, and often times takes up entire pages. It is some really great stuff. Everything in the box is of high quality with the one exception being the ruler but honestly, you likely have a tape measurer lying around somewhere. 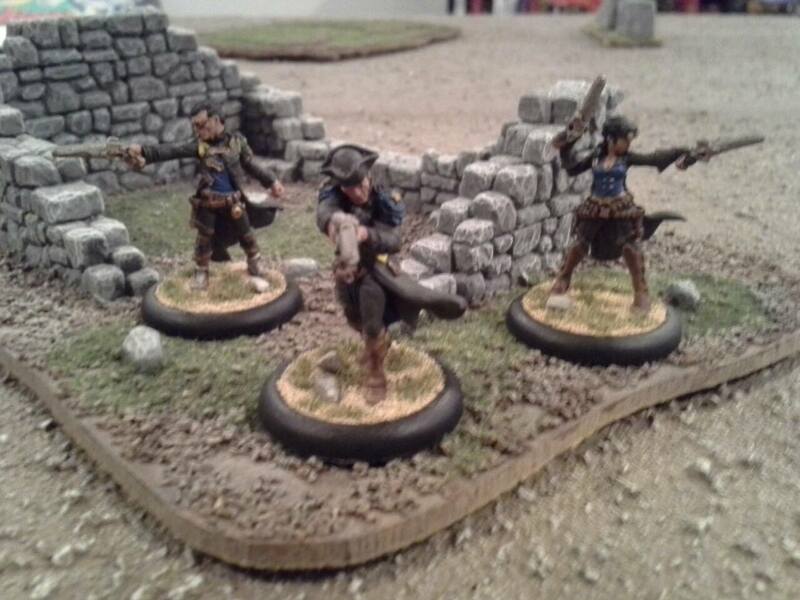 As mentioned above the only additional items you may need to provide yourself would be some kind of super glue to piece together your miniatures and you’ll likely want to invest in some paint at some point to add your own style to your pieces. 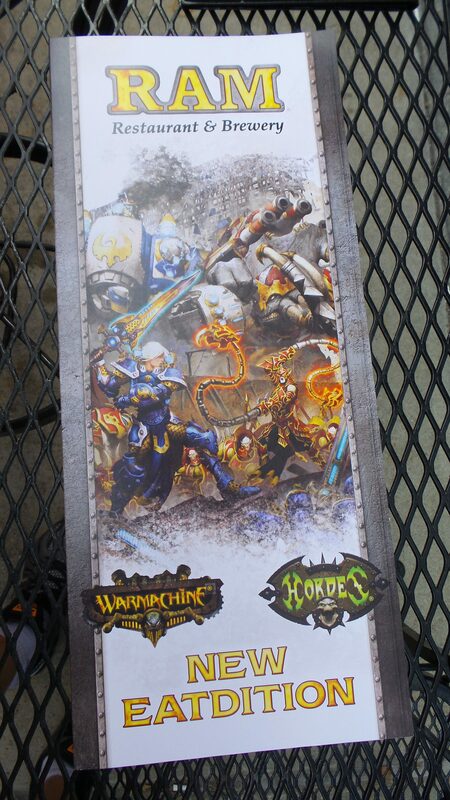 Veteran players are going to buy these starter sets for one reason, the new Warcaster\Warlock. Which leads me to my only real complaint about the sets. I really wish they would have switched up what Warjacks\Warbeasts came in the new Battlegroups. From what I can tell, with little deviation, most Battlegroups remain completely unchanged, excepting the Warcaster\Warlock of course, from their mkII counterparts. This means that the veteran players who are buying this item are typically only doing so for one miniature. 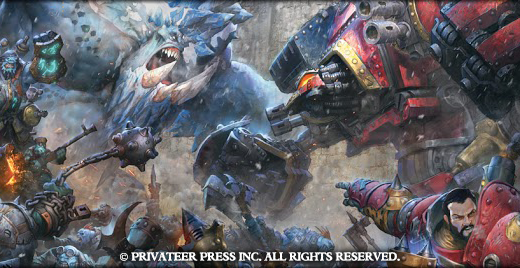 I’m not saying PP needed to craft entirely new Warjacks\Warbeasts for this release but maybe they could have just switched a few out for different models. There’s no way to be certain you wouldn’t also land on some items a veteran player might have already had but at least there’s a chance that way. However, using the same models in this edition as the last ensures that a we receive the same pieces we got the last time we bought a starter set. The Battleboxes have an MSRP of $39.99 and are the be all end all way to get started in this hobby (at least until the Two Player Battle Boxes come out in August). Pick a faction you’d like to play as, grab a Battlebox, and go to war! P.S. When searching for any Warmachine or Hordes battlegroup be absolutely certain you are purchasing the third edition item of the game. 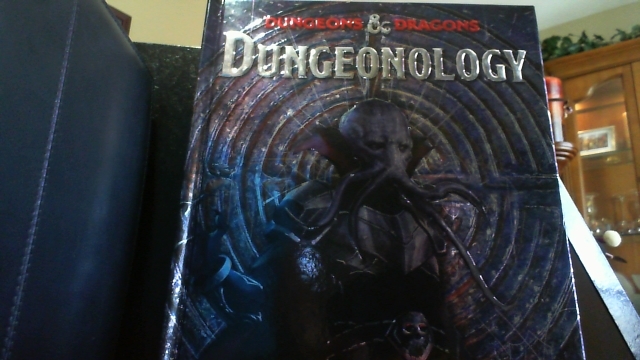 Things look very similar when compared to the 2nd edition. Look for descriptors mentioning that the item was produced AFTER June 1st 2016, or that it is part of the third edition of the game.